This manual represents the manufacturing practices and related scientific and technical information of the many steel producers that have been reported. 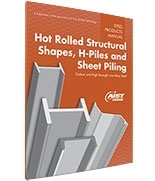 Contents include metallurgical aspects, manufacturing methods and practices, structural quality descriptions, specifications and tests, permitted variations (tolerances), and steel sheet piling. Additional reference information includes grain size, atmospheric corrosion, material property survey, mill markings, surface imperfections, carbon equivalent, toughness, curving shapes and galvanizing shapes.